Stewart R: 'The grass is always greener'. Or is it that you're looking 'green around the gills'? Either way, in the comic world today the colour mentioned is certainly right! The news has bursting forth from behind the DC doors and other quarters in the past 12 hours and it surrounds the near-term future of one of the publishers most popular lines. Initially it was announced on the DC website that longtime Green Lantern lead writer and Chief Creative Officer at the publisher, Geoff Johns will be ending his run on Green Lantern this May with the bumper sized #20 issue which will also cap off the 'Wrath of the First Lantern' event. Upon hearing this news my heart sank somewhat and my brain was awash with solemn understanding. After ten years of steering the adventures of Green Lantern Hal Jordan, the rest of the Emerald Corps, their allies and enemies and elevating the property to great heights following a downturn period of the late '90s and early 21st Century brimming with fan dissatisfaction, it is now time for Johns to step aside and concentrate on his other titles - Justice League and Aquaman - and his larger responsibilities within the organization. Cut to a few hours later when I return from a trip to a local public house involving a few beers, geek chat, a look at the upcoming Previews, and the odd word about Johns moving on with a few of my PCG comrades. Oh! What’s this, more news? What?? Pretty much EVERYONE is leaving the Lantern titles in May?! Yes, it seems that Geoff Johns’ announcement was just the small snowflake that we were to all focus on before the avalanche of creative shuffling caught us all in the back of the head and whisked this particular reader away down the hill and quite possibly away from one of his favourite DC properties. It appears that DC have decided that now is the time to spin the creative wheel what with the 'Wrath of the First Lantern' event coming to a close and all four titles in it’s armoury reaching suitable points to reassess and redefine. 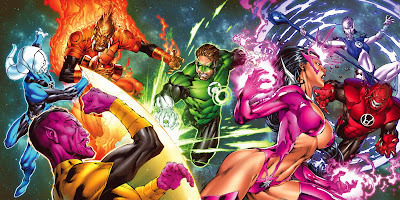 Considering that collectively the Lantern books have been keeping the DC share of the Top 100 at least respectable behind Justice League and a handful of the Bat-books (okay, Red Lanterns has lagged behind by a little way comparitively) it’s a little surprising that they’re going to supposedly take something of a gamble. The New 52 doesn’t seem to have been the success that DC were hoping it would be and for the most part the Batman and Lantern portions of the universe were relatively unaffected by Flashpoint and the slide into the relaunch, Johns and Tomasi’s storylines from previous years making the transition seamlessly. I can only imagine that the powers that be have decided that an additional boost in sales can be (briefly?) garnered from a sweeping change that will, in their eyes, reinvigorate interest in the Green Lantern property and potentially bring back readers who may not have appreciated Johns’ broad and all-encompassing plots. I certainly know that some of the PCG, who were strong GL fans in the past, have since drifted away from the title as the mythology and cast expanded, while readers like myself were lured in over the past decade or so by the rich history lesson that seemed to be provided on the spot. 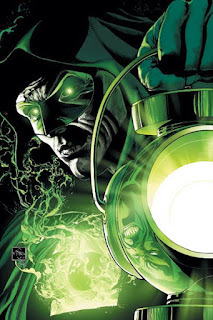 My personal opinion is that Geoff Johns delivered the ‘big ideas’ well and he certainly understands the complex Hal Jordan from head to toe, but it was Peter Tomasi and his brand of tight dialogue, gritty tension and fraught emotional plotting that really gave these books their sheen and the rest of the Corps and their enemies their distinct voices. If it hadn’t been for his consistent work in the few issues of pre-Blackest Night, Green Lantern Corps that I picked up on a whim, I don’t think I’d still be reading these titles today. Both writers have received high marks from me in reviews over the past few years for their work and I now consider myself a GL fan and convert thanks in particular to their efforts. Could the Corps' Brightest Day be behind them? While I certainly won’t write off the Green Lantern books before the May/June switcheroo, I’ll be watching the future solicitations very carefully indeed to see just who DC pulls in to replace writers of such talent as Johns and Tomasi and artists like Doug Mahnke and Fernando Pasarin. Looking around, I’m not really sure who the publisher will be able to reel in to help drum up the necessary amount of buzz and excitement. Whomever picks up the reigns, the hope has to be that we get a consistent and focussed approach to the next interation from all involved and I await the surprises to come. At the time of writing this I’m picking up just four DC titles on a monthly basis; Batman, Batman and Robin, Green Lantern and Green Lantern Corps. It’s sad to think that depending on the decisions that DC make from here, that collection could be halved come June, yet I have to applaud the creative teams who ensured that the GL books appear on that list in the first place! Well done to each and every one of you.